For Roberto Luongo and the Vancouver Canucks, things have settled down a couple of weeks removed from October, but Luongo and the Canucks' fans cannot get much respect these days. While Lou gets slammed for a few mediocre performances, Canucks fans are labeled as fickle band wagoners with no respect for their team. So, is Vancouver really a goaltender graveyard? In short, no. A brief history of the past 15 years will explain why Luongo is under such immense pressure, and this goes beyond "playing hockey in a Canadian city". At one time, Kirk McLean was the man in Vancouver, heck - he still is. But after the mid-1990s, there was a revolving door between the Canucks' pipes. Vancouver tried at least nine (9) different starting goaltenders before Roberto Luongo: Corey Hirsch, Sean Burke, Arturs Irbe, Garth Snow, Kevin Weekes, Felix Potvin, Bob Essensa, Dan Cloutier, and Alex Auld. Some of those starting goaltenders enjoyed tremendous popularity in this city, while others were almost run out of town.Corey Hirsch, Bob Essensa and Alex Auld were fan favourites to varying degrees, in part because not much was expected of them. Essensa was a journeyman. His tour in Vancouver resulted in regular chants of 'Bobby' even though his teams struggled on the ice. Hirsch and Auld were thrust into more prominent roles and did not have the expectations of full-time duty or stardom quite yet. Veterans like Arturs Irbe, Sean Burke, and Garth Snow were largely given a free pass because the team in front of them was often incapable of defense built for offense, with Jyrkki Lumme and an aging Dana Murzyn as their top pairing. However, due to their mediocre performances, none really hung around long enough to build a rapport with the city to evaluate any highs or lows. This time was definitely a forgettable area in Vancouver hockey. But there were three goalies to lace up the skates for the Canucks before Luongo that conjure the term 'goaltender graveyard': Kevin Weekes, Felix Potvin, and Dan Cloutier. Why were they treated differently in this city? Expectations. 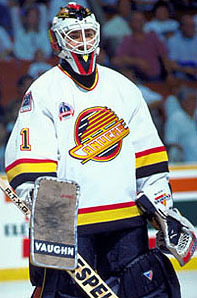 Kevin Weekes was heralded as the 'goaltender of the future', but never lived up to expectations in Vancouver. Oh, and he was a key piece of the Pavel Bure deal with Florida. When you're traded for the most dynamic player in franchise history, there are plenty of expectations. 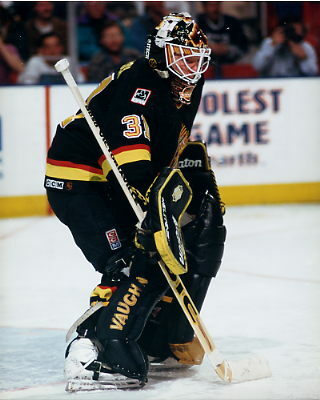 Felix Potvin was brought in for Kevin Weekes (along with Bill Muckalt and Dave Scatchard) and was supposed to be a stabilizing force in Vancouver, who would bar the door and let the team's dynamic offense do their thing. Of course, Potvin was a shadow of his former self, and was ushered out of town after less than two seasons. Then, in 2002, the Canucks brought in Dan Cloutier from the Tampa Bay Lightning. Cloutier had promise, but over the course of his career with Vancouver, appeared to be the weak link on a very strong team, as playoff failure after playoff failure ensued. 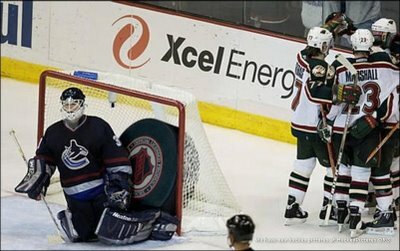 Whether it was an all-star laden Avalanche squad, Nick Lidstrom's goal from center ice, or the meltdown against Minnesota in 2003, Cloutier's fourth playoff run ended with an injury and another early exit in 2004. Regardless of their individual performances being above or below their talents, these three men were the most criticized in Vancouver because of the expectations heaped on them. All were good goaltenders at times, but they were oversold to fans and they under-delivered. Kevin Weekes was a decent prospect with potential, not a 'goaltender of the future'. Felix Potvin was a journeyman, stop-gap solution - not the team's savior. Dan Cloutier was an average starting goaltender on a good team, not an all-star netminder. The same story is true for Roberto Luongo. Roberto's ego was stroked endlessly as his star blossomed in Vancouver. Indeed, the "man who's GQ cool and Eagle Scout nice" was traded for one of the faces of the franchise in Todd Bertuzzi, and was heralded as one of - if not the - best goaltender in the league. Roberto became the face of the franchise, and the first goaltender named captain in the NHL in generations, but as one member of the Vancouver media felt, "there are athletes who define a city, such as Michael Jordan in Chicago and Peyton Manning in Indianapolis, but even they took years to reach that height. 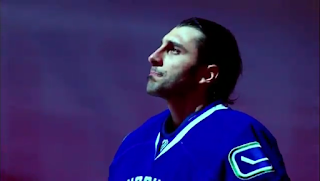 Luongo accomplished the feat in Vancouver in a matter of months." Well, let's set the record straight on why Canucks' fans turn on Roberto so easily and make him the Luongoat. In Vancouver, like any city with a passionate fan base, it's all about expectations. 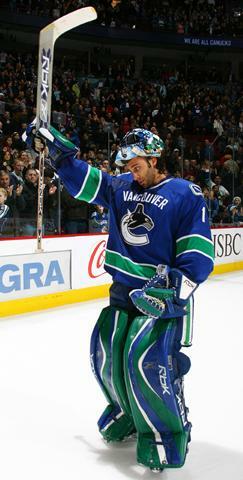 Luongo is a good goalie, the team hung him out to dry at times too. Sometimes he does give up an early or late goal and lose shutouts or leads late... sometimes he gets blown out. Not unlike other greats like Brodeur or Roy. Lou needs a Cup and all criticism will cease.